Want to send a card to a special someone in your life but bored of the bland offerings in the shops? Moonpig lets you easily customise a range of cards for any occasion as well as a selection of gifts to create something that will be treasured forever. And with a Moonpig voucher code, you can treat your loved one without breaking the bank. Whether it's a birthday, Christmas or Valentine's Day, Moonpig voucher codes let you express yourself for less. Founded in the UK in 1999, Moonpig was set up to utilise the power of the internet and emerging digital printing technology to offer customers an easy and affordable way to create personalised greeting cards for a variety of occasions. 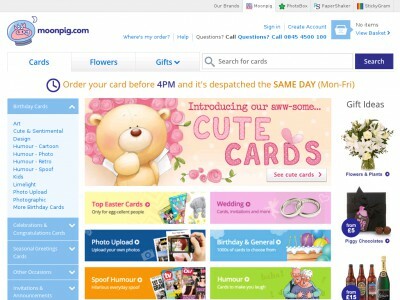 Now the largest online personalised greeting cards website in the world, Moonpig ships millions of cards every year to customers in all corners of the globe. Now offering a wide range of greeting cards and gifts sourced from both in-house designers and partner companies such as Disney and Nickelodeon, Moonpig has something to suit all ages and tastes, for any occasion. Most widely known for their 'photo upload' cards which allow customers to place an image of their choice in the centre of the action, Moonpig also offers humorous cards, retro cards, children's cards, seasonal cards, congratulations cards, invitations and more, as well as beautiful flower bouquets and gifts such as personalised mugs, t-shirts and bottles of wine. Moonpig's key selling point is that it allows customers to personalise the text included on the cards or gifts they purchase, creating a unique keepsake to bring a smile to anyone's face. Now based out of a production facility in Guernsey with offshoots in Australia and the United States, Moonpig is an ethical company, using cards from certified sustainable forests approved by the Forest Stewardship Council and working with XLP to create opportunities for young people living in inner cities. Want to check out Moonpig's fantastic products for yourself? With a Moonpig voucher code you can order your own personalised greeting cards for less. Whether you want to wish a friend a happy birthday or bring a little festive cheer at Christmas time, a Moonpig discount code is a great way to make someone feel special and make great savings too. Responsible for 90% of the UK's online greeting card market. Browse our website to find a Moonpig promotional code that suits your requirements, then navigate to their website to start shopping. Select a card you like and click 'Personalise'. Add your text and click 'Order now'. Fill in the delivery details and click 'Next step'. Click the text that reads 'Got an offer code? ', enter your Moonpig voucher code and click 'Apply'. Want to check out what's happening behind the scenes at the world's largest online personalised greeting card store? For fantastic original content, tutorials on how to use the site, information on Moonpig's partner charities and more – not to mention updates on the latest Moonpig discount codes – pay a visit to the company's Youtube channel. Encompassing many categories such as humour, artistic, children's, romantic, retro and more, you're sure to find the perfect card or gift for any person on any occasion. And with a Moonpig discount code, you can make big savings while giving your loved ones something they will treasure for years to come. couporando.co.uk is the best website with valid Clintons coupons. If you haven't found any coupon of interest, you can always check Flowers & Gifts category to find shops similar to Funky Pigeon, Hallmark or Interflora. Visit the homepage and browse through the categories to find the perfect card or gift. Click on the thumbnail to see a larger image then click 'Personalise' to order. Click on the card to personalise then click 'Order now' when you're finished. Choose where you want the card to be delivered. Choose a delivery method and click 'Next step'. Click the text that reads 'Got an offer code? ', enter your Moonpig promo code and click 'Apply'. Enter your payment details and click 'Checkout'. The postage cost for a standard card is £1.24 First Class, with options for Special Delivery and Special Delivery on Saturdays. Need to get in touch with the team at Moonpig? Whether you need technical assistance with uploading images or editing cards, you have a question about your order or you just want to find out more about saving money with a Moonpig voucher code, the Customer Service team are on hand to help. You can contact them by telephone on 08454500100 or by filling in the online contact form here. Want to keep up to date with the world of Moonpig? The company maintains profiles on several of the major social networking site, so you can see the latest designs, peek behind the scenes at Moonpig HQ and find out about saving money with Moonpig promotional codes. Don’t forget to check them every now and then, as you can never be sure when a free Moonpig promotional code might show up! With the Moonpig app for IOS and Android you can upload photos straight from your phone and incorporate them into a wide range of greeting cards and gifts. You can add personalised messages and texts, then order them on the go – so you'll never miss an important occasion again! Buy now online at www.moonpig.com/uk/. Anytime I need a greeting card for a special occasion, there are 2 reasons why I visit Moonpig.com/uk/: 1. Their selection of cards is outstanding, and 2. I can use a Moonpig voucher code to receive a discount on all the great products that Moonpig offers! Regardless of the occasion, Moonpig will have the card you're looking for, and you'll receive the right discount should you take advantage of our Moonpig discount code. You can use a Moonpig code for free, and it doesn't even require registration, so why not use one the next time you need the perfect card?